The mobile platform to reach your audience. Reliable and innovative technologies which are easy to incorporate. CM.com is a cloud-based delivery platform for all communication channels including SMS, Voice, Email, Chat apps and more. Companies such as yours use our platform for real-time communication with clients. Successful companies integrate these communication channels with their business processes. The availability of API’s and SDK’s eliminates development time and costs for enterprises. Create new digital business initiatives and improve your customer experience. Customised intelligent modules for specific applications such as 2-factor Authentication or Text-to-Voice. Use our reliable SMS solutions to send out notifications, marketing campaigns, authentication requests, payment confirmations, appointment reminders, etc. 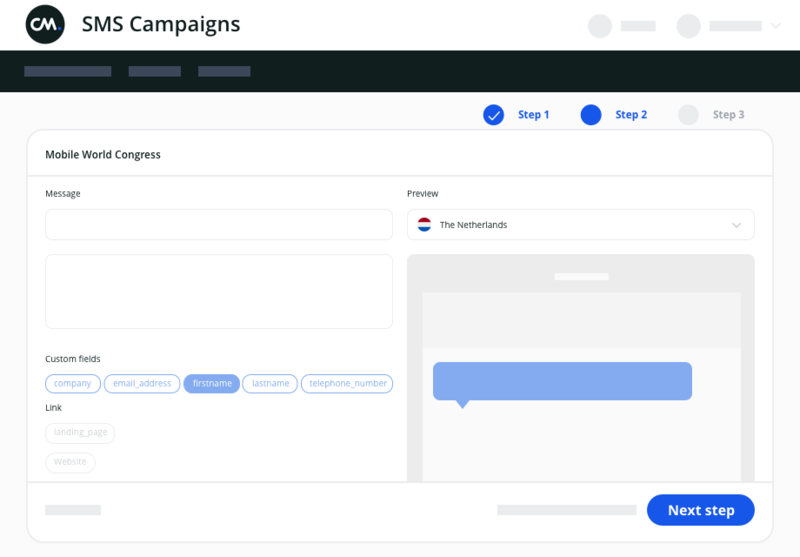 Campaigns provides an intuitive self-service interface (WebApp) to help you send SMS messages and campaigns, with advanced personalisation features and engagement statistics. Integrate CM's SMS Gateway via HTTP or SMPP to benefit from 60+ direct carrier connections to deliver your text messages worldwide with higher quality and security. Send SMS online with just a few clicks via the CM online Platform. No technical skills needed with our intuitive self-service interface. Use your own email clients to send messages worldwide - sending SMS is now as easy as sending email. Compatible with any mail program. Reduce costs on your local and worldwide outbound voice traffic with our reliable and high-quality SIP Trunk connection. We offer competitive and transparent call rates without setup costs. No need to pay per minute, you'll pay for your calls per second. Your worldwide traffic is terminated only by the best quality routes. Our advanced routing techniques ensure the quality while we offer the best prices for your calls. A SIP Trunk subscription is all you need for outbound calls. Next to that, CM offers inbound services so you are available always and everywhere. Connect your system to CM’s Voice Platform via internet. No need for complex infrastructures, an IP ready telephony system is all you need. Clear technical documentation is available. Our platform is connected to 2000 operator networks in 200 countries so you can benefit from high quality routes at the best price. With high uptime and a redundant setup, you can rely on our highly secure and ISO 27001 certified platform with 24/7/365 support from our Network Operations Center. CM.com offers a scalable cloud infrastructure and is geo-redundant. All services run on direct telecom operator connections and our in-house developed applications. These are built, optimised and monitored by our 100+ skilled developers each day. This guarantees high availability of our platform and continuous innovation of our services. CM.com guarantees all your messages and data will remain in the EEA. Use our CPaaS capabilities with direct operator connections to make sure you meet all GDPR requirements. CM.com Recognized as a Representative Vendor in May 2018 Gartner Market Guide for Communications Platform as a Service. At CM, you can count on a secure and reliable CPaaS solution. Our cPaaS offering is ISO certified and supports enterprise required security, privacy and control capabilities which are provided through a SLA, a Network Operating Center available 24/7 x 365 and optionally VPN or MPLS connections. CM.com offers not only a cPaaS but also a rich Payments suite and Digital Identity services. This allows for a full Customer Journey improvement in your Digital Transformation process.